You may like to develop your character in detail before you begin writing your story, or you may just start writing and see where the story takes you. 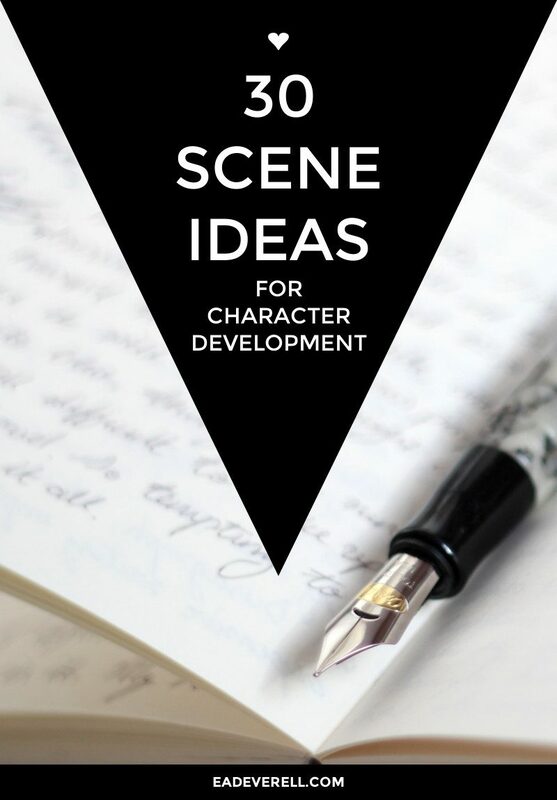 Either way, you need narrative opportunities to show the reader what stuff your character is made of, and these scene ideas can fit almost anywhere in your story. They’re also perfect for NaNoWriMo! Pick one to write about every day, and mix them up with upcoming plot and subplot scene ideas! CONFLICT, TESTS & TRIALS – any time the character faces resistance in their world, there is an opportunity to reveal something new about them, or to reinforce an existing trait. The more pressure the character is under, the more you will need to develop them to meet their difficulties. REACTION – meaningful and consistent reactions to the events around them are what create characters. This might take the form of action, reflection, interaction, decision-making, or even inaction. REFLECTION, SELF-ASSESSMENT – character doesn’t always have to be developed through action. Sometimes solitary reflection and assessment can be a great way to slow down and delve deeper. INTERACTION, RELATIONSHIPS – in many ways, the character is defined through contrast and correlation to the other characters in the story. Relationships apply push and pull forces on the character that cause them to react, make decisions, and re-assess their own identity. CHANGE, PROGRESS – one of the main differences between a flat character and a round one is that a round character changes, whereas a flat character stays static. A character’s reaction to change is one of their most defining traits and will often influence their other characteristics. DECISIONS, CHOICES – decisions are where the plot intersects the character’s mind most clearly. The sorts of decisions characters are faced with can be as telling as their later reactions to the path they chose. The character has a heart-to-heart with a Helper. The character trains with a Mentor. The character completes a mini quest to get past a Threshold Guardian. The character questions their relationship to the Antagonist. The character receives bad news from a Herald. The character realises that they were deceived by a Shapeshifter. The character recognises an aspect of themselves in another character. The character is forced to wait for someone or something. The character is forced to ask for help from a character they dislike. The character confesses their deepest fear or secret to another character. The character must negotiate with a character or group of characters. The character loses or sacrifices something they value greatly. The character sees or hears something they weren’t supposed to. The character tries to understand the motivation behind another character’s actions. The character tries to evade or escape another character. The character is forced to make a difficult decision that will affect others. The character is abandoned by someone they love or value. The character tries to convince another character to act. The character reacts to mental or physical pain. The character needs to work together with another character. The character is rejected by another character or group of characters. The character looks back at how far they’ve come. The character undergoes a rite of passage. The character becomes responsible for other characters. The character learns their true name and origin. The character tries to master or conceal their thoughts or emotions. The character faces their own, or another character’s death. The character questions a belief that has shaped their personality. The character loses all hope that they will succeed. The character contemplates their future. Need more help developing your character? How to Be the Heroine of Your Own Story is an online course that teaches you how to develop your character on just one page. Click here to learn more.